Register Log In GliderCENTRAL Forums Bonding & Relations IDK what I should do tonight! So I have 2 sets of girls. And the intros in the past have been bipolar on my older girl spice's part. One moment she likes the babies, the other times she doesn't. Well to get to the point, I took all my girls out today and had them in a dual bonding scarf. My older girls had loads of energy and wanted to run off and play so I let them. And I spent time just petting on my younger ones. Well spice wanted to check out the lil ones, normal on her part but usually when she's bipolar mean is during playtime, well not this time!!! She actually hung out and let the little ones get on her and now I have 3 gliders down my shirt being sweet. 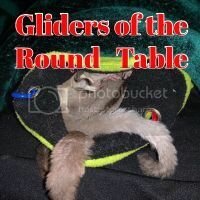 Now here's my question.... sugar (my other big glider) does not want anything to do with them. I tried to get her to see them and NOPE! she's climbing curtains. So tonight, do I put spice in with the lil ones and leave sugar alone? Or should I keep my two big girls together still and just try to do a few more group playtimes together until sugar is warmed up to them as well? It sounds like progress is being made since your original post on February 6th when Feather/Kim advised you to give them a little more time for the youngest to catch up on size and to continue swapping pouches. Have you continued with the pouch swapping? I am assuming they are in separate cages. I would still continue with your routine for a while longer in hopes that Sugar will come around and want to participate with the others. BTW, I would not label them with bipolar behavior. They are simply behaving as gliders do. Nothing more. Sometimes they get along very well and other times they simply do not. They may just need more time and patience. I agree, they are definitely progressing along. I decided to keep spice with sugar last night, spice ended up leaving the lil ones in hunt of her sister and I found them curled up together. And I only say bipolar as a way to describe the drastic change in her attitude towards the lil ones. I know they are just getting a feel for eachother. And yes I've been pouch swapping and toy swapping, I recently bought some mesh to put between the cages, and now their cages are side by side, it's been like that for 4 days now. Sugar did end up greeting one of the lil gals, it went well for about 3 minutes before they had a small tiff. Which is great progress to me since she usually 100% avoids them at all costs. Once they were tuckered out I put the two sets of girls in thier own pocket of my dual bonding scarf and just let them be for an hour. After that I started my usual belly rubs rotation, sugar like normal wanted out and fell asleep on my lap. She doesn't care to be messed with while she's trying to sleep, my other 3 love belly and chin rubs! Update for another positive day! Guys look!!! All my girls are together in one pouch!!! That is a sugar face amid all that white baby fur!!! I took a small chance on putting them together. I started by just taking thier sleeping pouches and grabbing my bonding scarf. My gals always wake up and want treats so I started off by giving them apple slices. I then put spice into the lil ladies sleeping pouch and moved her apple slice over. I wasnt going to do anything with sugar but leave the pouches by eachother but spice and storm both kept poking thier heads out and tried to get into the pouch she was in... I tried to think of what would be least stressful on sugar's part and decided it probably wasn't being cornered by 2 invading gliders. So I took her out and left both pouches open and gave her the chance to decide to join the other ladies or go back into her sleeping pouch and SHE CHOSE TO BE WITH THE LADIES!! Cute pics!!! Love to watch them sleep! After I posted all my super excited "they're in one pouch!!!" Pics, I decided to put them up. They had been in the same pouch for 4 hours and I had an early day. So after my shower I went to give them thier dinner and Sugar and Storm were awake and wanting out! I let Sugar run off to play while I kept Storm on me (we are still working on the lil ones coming back to me so I dont let them go off and play just yet). Well the other 2 woke up soon after and I decided "why not", I wanted to see how they played together and if Sugar would be sweet or not so I let all of them do whatever (with close eyes on the babies). I'm making a pot of coffee now and I will be up to watch how everything goes, but I think itll go over well. When I was taking apart thier cage to rebuild/merge it the lil girls stayed in thier pouch and the big girls went to thier favorite "hidey spot" in the couch. Once it was together I put the big girls in the family sized pouch (none of them have ever been in that one) after a while Sugar came out, and the second Storm saw her she ran right over to her and it was greated with happy chatter and some kisses! Snow was a lil spooked out from all the noise so once I saw she was too scared to leave the pouch to explore (a good 10 minutes) I moved her over and they let her in the pouch no problems at all. It's something new to try more than likely. Congrats on the new quad!!!! Thank you!!! I'm so happy and excited that they are together!! !